And, on the seventh day, he rested from all his work. Not applicable if you are a football fan. While the powers that be were chillaxing yesterday, the NY Giants did not relax and created a Sunday miracle, one I have not seen for way too long. The Giants went into Texas for the second week in a row and worked the system (just like my #1 choice for the senate, Beto O’Rourke) finally pulling out a victory in the Lone Star state. During the NFL season, we head to our daughter’s downtown abode early on Sundays to prep before the 1pm kick off. We have a busy pre-game ritual in our family…doggie wash day, mani/pedis and a Saigon Shack lunch. We are then fortified and ready to take on the emotional highs and lows of being devout NY Giants fans. This weekend we actually hit the sports fanatics trifecta…the Yankees clinched a playoff spot, Syracuse Orange football team is 4-0 and the Giants finally won a game, resembling a genuine, professional unit. I normally hate Sunday nights, but I actually experienced a warm fuzzy feeling around 11pm, after watching my 4th football game and still feeling swaddled in the comforting embrace of a Giant victory. 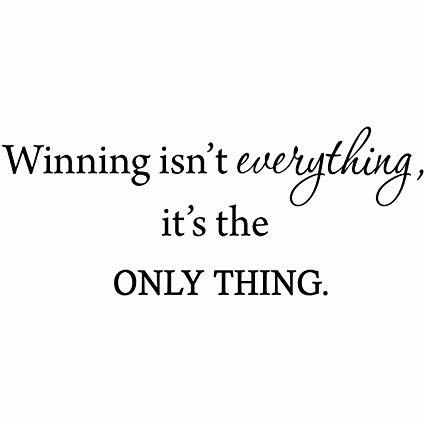 I gotta be honest, winning is the only thing.